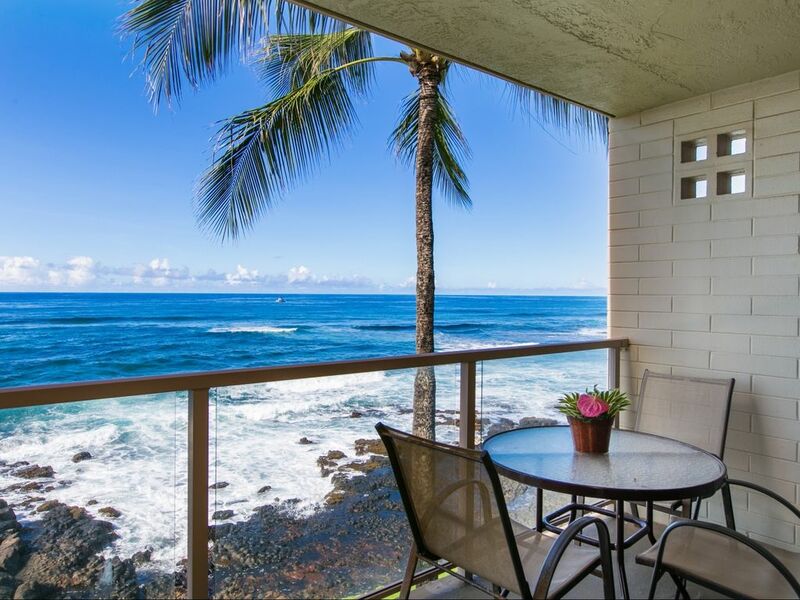 Our light, bright, spacious, and comfortable two bedroom-two bath Poipu Beach oceanfront vacation rental condo sits 40 feet from the ocean's edge. Floor to ceiling glass windows provide unobstructed panoramic ocean views. You can see spectacular sunsets, giant sea turtles, dolphins, and whales from the comfort of our living room and the lanai. The sounds of the ocean are relaxing - a perfect soundtrack to this paradise. Walk only 100 feet to reach one of the most famous beaches in the world to sun, snorkel, boogie board, and snooze. Travel channel ranks the beach in front of this condo as one of the premier beaches in the United States and Sunset Magazine described it as offering the best swimming and snorkeling in all of Kauai. A vacation in Hawaii doesn't get any more beautiful. New Installed Air Conditioning in main living area and master bedroom. Full ocean view - 30 feet from the water. Showers set up for individuals who require rails to hold on to.